Excellent leather dog collar is here! 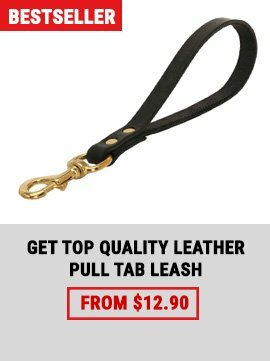 Buy today exclusive dog collar for good price! Designed to be a part of instrument to connect you and your Cane Corso dog and make these relations stronger day by day. 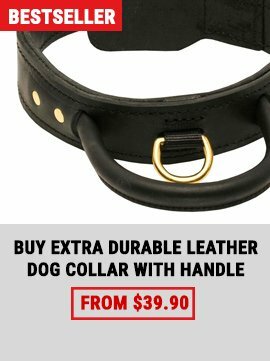 Premium leather of this collar is uniquely soft and sturdy. 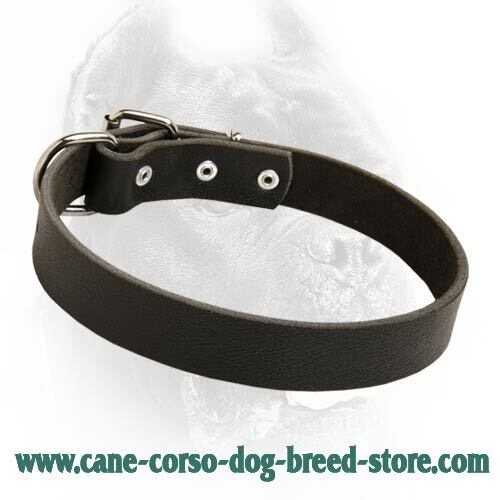 The collar was made to fit every Cane Corso dog individual neck’s measurement. The collar is easy to connect and release due to availability of steel nickel plated buckle. 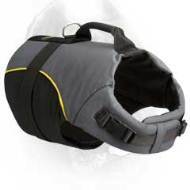 Also this model is very comfortable for the dog to wear even in stressful working situations. Wide leather strap contains no decorative elements which are not always appropriate for every situation. 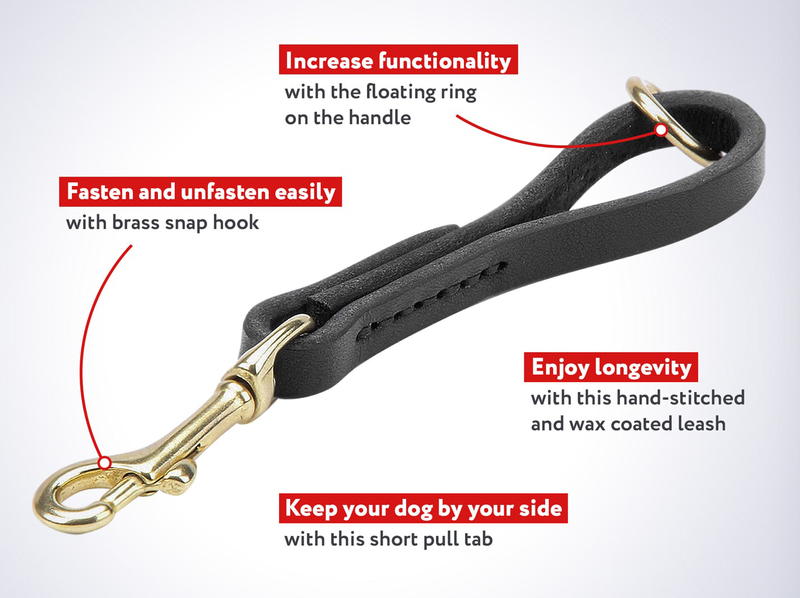 It is traditional buckle dog collar with an easy adjustable convenient buckle. This Personalized Leather Dog Collar is shamelessly easy to use! Cane Corsos deserve to be worn in best equipment! We offer you now a piece of equipment, low-cost everyday dog collar, easy adjustable and comfortable, stylish and beautiful. Pay just little sum of money to get this unique dog tool. If you do not buy this dog collar you will never know the distinguished qualities and admirable benefits the collar is famous for. Only handmade leather dog collar may sit on dog perfectly, as every smallest detail of it was considered during its manufacture. We select excellent hide from which to cut your leather dog collar, then we duly work this precious leather piece to turn it into marvelous dog collar. 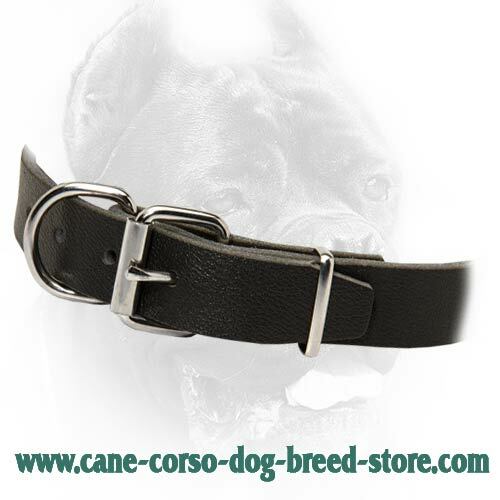 Detailed study of dog anatomy has helped us not to commit mistakes when making such responsible job as creating leather dog collar for Cane Corso breed. Smooth surface of the leather strap, absence of pimples, rounded edges resulted from careful and correct operation of our direct makers. Dog collar which you see on this page is a combination of best characteristics. Check for yourself to know style and perfection of handmade dog article. Cleverly designed leather dog collar is a success in dog education. This Personalized Leather Dog Collar will never make problems when being on your dog. Even theoretically we can’t admit it as we have made a millions of dog collars for different dog breeds and now most of them are fully grown dogs, some are too old and we heard their owners say about these dogs as sociable, loving and obedient canines. Much depends on dog collar when raising well-bred dog. Safety provided by this collar is invaluable. 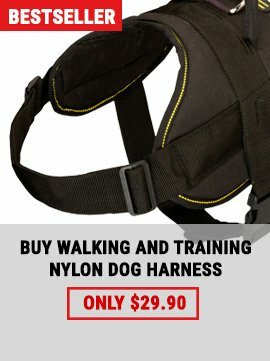 You will be able to hold your dog back when a danger threatens him. Reliability of this collar consists in its durability and long life. Use this collar in any weather, but do not presume upon wearing in rainy weather, as wetness is undesirable for leathern things. But in general, this Personalized Leather Dog Collar is a multitasking dog tool. 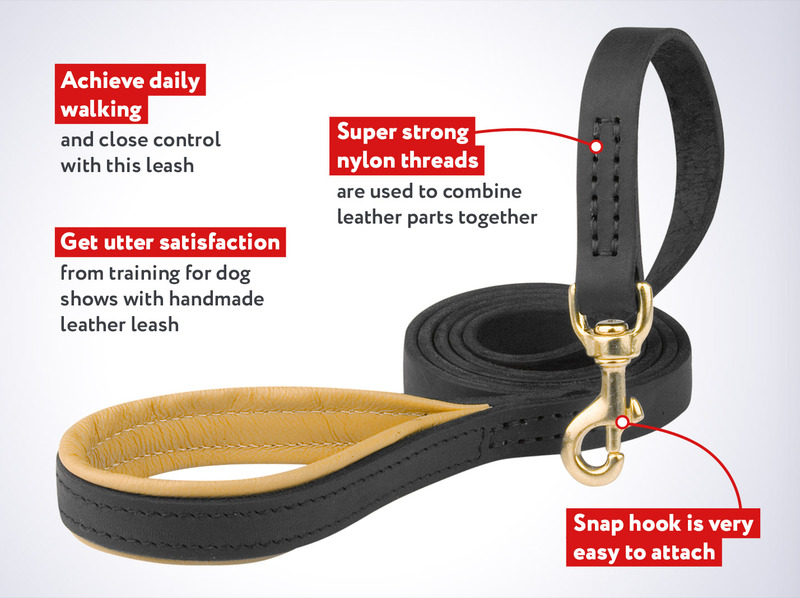 Since leather is a natural product your dog may wear this leather dog collar regularly. Thick leather strap does not stretch, does not wrinkle, does not seam if necessary care is given to this wonderful accessory. Great look and admiration of passers-by. Do not you like seeing delighted glances of passers-by attached to your dog? So, when you walk with Cane Corso dog wearing this collar you will hear compliments addressed to your doggie.